Block 7 concept drawing from Pablo Properties with Children's Museum. Click for a biggie. Three Chippewa Valley institutions that focus on children and families have announced two unique partnerships that will be made possible when the Children’s Museum of Eau Claire moves into a new home in the near future. The three entities say the new partnerships will save money for the nonprofit agencies involved while also helping families by offering a range of services and opportunities under one roof. “We couldn’t be more thrilled about this opportunity,” Children’s Museum Executive Director Michael McHorney said of working with the school district. He said the museum planned to align its new facility with the early-learning model used by the district. The two-section pre-K school will be part of the school district’s Eau Claire 4 Tomorrow program, which offers free, half-day 4-year-old kindergarten classes for children at 21 locations throughout the community, most of them private child care centers. Eau Claire School District Superintendent Mary Ann Hardebeck said the partnership with the Children’s Museum will give families another choice for their kids’ early education. “I think this is going to provide a very deep and rich experience for many students for many years to come,” she said. The new partnership began, Hardebeck said, with a conversation over a cup of coffee. “When we started talking about the possibility of a preschool program housed at the museum, it just hit so many of the buttons, the things that we are trying to do in the school district in terms of providing opportunities for intentional play with students so that we can do that great work to develop their young brains and get them ready for school,” Hardebeck said. This isn’t the first collaboration between the Children’s Museum and the school district. Since the museum opened in 2004, it has worked with the school district to provide all district kindergartners with a field trip experience. In 2016, the museum began offering summer school classes for pre-K through fifth-grade students. At a press conference, McHorney signed a letter of intent with Hardebeck to create the preschool partnership as well as a letter forming the partnership with the Family Resource Center. The latter agreement was also signed by Dr. Jennifer Eddy, interim executive director of the FRC. Under the terms of the partnership, the Family Resource Center, which is currently located at Oakwood Mall, would co-locate with the new Children’s Museum. Eddy said this will benefit the Family Resource Center by giving them shared access to office space and other resources. However, they would also have their own dedicated space and be able to maintain their own identity as an agency, she said. The Family Resource Center, which was founded in 1999, provides education, prevention, support, and networking for families, particularly those with children from birth through age 5. Among other programs, the FRC offers Parent Café gatherings, one-to-one parent mentoring, and playgroups for young children. McHorney said that in its new home the museum intends to create a “Center for the Young Child” – an area for toddlers that could be used by the FRC for playgroups and programs. In addition, the museum hopes to build a sensory room that is designed for special-needs children. McHorney said the new museum will have about 21,000 square feet indoors plus outdoor space on a “green” roof. The current museum, 220 S. Barstow St., had about 15,000 square feet on three levels. Late last year, the city’s Redevelopment Authority, which owns Block 7, entered into an agreement with Pablo Properties for Pablo to develop the site. 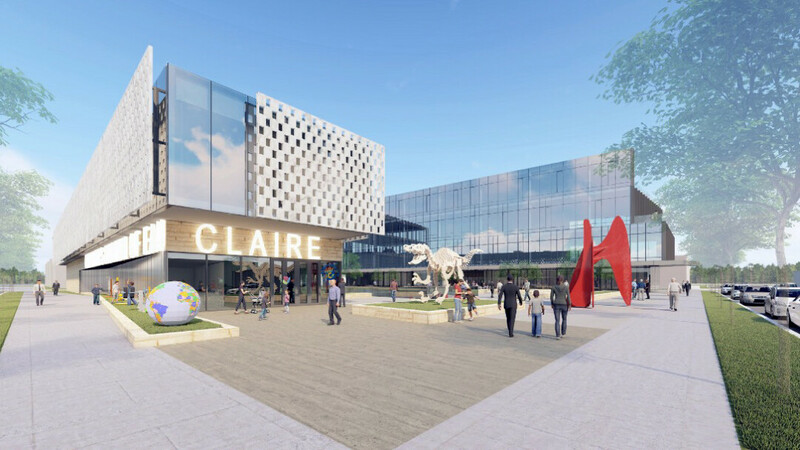 Pablo’s plans include a two-story children’s museum, a 125,000-square-foot office building that would include first-floor retail space for the likes of a bank branch or a small grocery store, and a public plaza including a water feature, green space, outdoor seating, and access to underground parking. Pending final city approval, Pablo hopes to break ground on the $32 million development this year. The museum is hoping to be moved into its new space by early 2021.